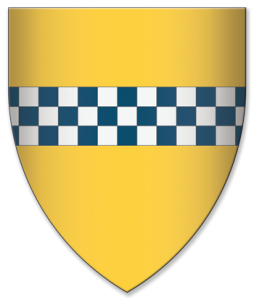 Walter Stewart, 6th High Steward of Scotland, was the son of James Stewart, 5thHigh Steward of Scotland and Egidia de Burgh. His father James Stewart was a supporter of Robert Bruce (the ‘Competitor’) in his claim for the throne in 1291. A young Walter Stewart took part in the Battle of Bannockburn where he led one of the four Scottish brigades. His cousin Sir James Douglas also fought with him. Robert the Bruce respected Walter for his courage and commitment and rewarded him with a knighthood at the Battle and the hand in marriage of his daughter the princess Marjorie, after their success. The Princess Marjorie was Walter’s second wife but the marriage came to a tragic end when the nineteen year old Marjorie gave birth to the future King Robert II at the roadside after being thrown from a horse. She died soon after. Walter had proven himself at Bannockburn and soon became a trusted adviser and ally of Robert I, taking part in the regaining of Berwick upon Tweed in 1318, and its defence against Edward II’s army in 1319. He was also one of the signatories of the Declaration of Arbroath in 1320. Walter Stewart married for a third time and died at Bathgate Castle, Linlithgowshire, in 1327. He was survived by five children. Sir Walter Stewart was the ancestor of the Stewart Royal Dynasty starting with his son King Robert II.